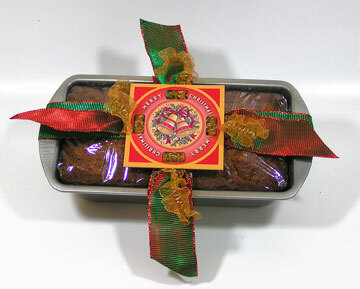 Banana Bread never looked so good gift wrapped with the Fobbie! It's that time of year when we start looking through our recipe books to find the perfect banana bread, fruit cake or Christmas cookie recipe. We often show our love and caring for our family and co-workers with bringing them baked goods. My heritage is Czech, so at the holidays we always made big batches of kolochky, which are basically a cookie with various fruit toppings. In Chicago, where I hail from, it was easy to get a can of fruit filling, not as easy in Colorado. When I find it I stock up. Now you have these beautiful baked goods, how do you dress them up to give them the same flare that your delicious baking has? I like to go to one of the dollar stores and pick up a nice bread tin, attractive plate, or holiday themed platter. I bake the bread in the tin, but then when cooled take out and wrap it in cellophane. 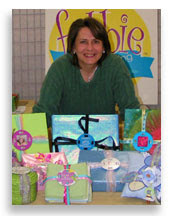 I pick the perfect Fobbie, get some ribbon and voila! A wrapping deserving of it's contents. I have also popped popcorn and flavored it, or used everyone's favorite—caramel corn. A nice big decorative tin Fobbie wrapped is so festive. Or perhaps flavored or coated nuts in a tin. I would think that if you do any type of "roll" that wrapping it in some colorful cellophane and finishing it off with the Fobbie would look nice. You could even do a three tiered grouping and hold them all together that way. You may consider using a piece of cardboard on the bottom for extra security. 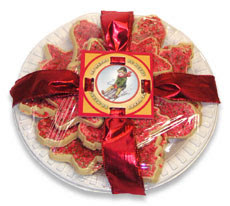 If you are doing any fundraiser bake sales for the holidays it would be a nice touch, that way if folks are buying it for gifting to someone else, it already has a beautiful presentation. You could then add some edible embellishments like candy canes, or aromatic ones like cinnamon sticks. There are so many possibilities, so get creative this year, and gift your baked goods some extra flare!